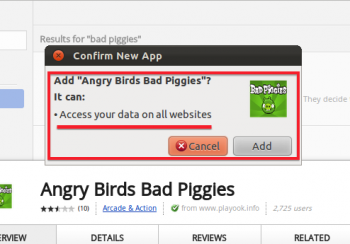 Eight plugins posing as Rovio apps were running ad-ware behind the scenes. Rovio's Bad Piggies is doing rather well at the moment, and if you're keen to try the game, you better make sure you have an Apple or Android device. If you don't own one, try and resist the temptation to download the free so-called "Bad Piggies" apps that are appearing in the Chrome web store, because they're actually packed full of ad-ware. Barracuda Networks, an internet security company, noticed that the Google Chrome web store was quickly getting populated with several Bad Piggies and Angry Birds apps soon after the original game's release. The eight apps at the time were all asking for the user's permission to "access data on all websites", which was a pretty tall order for a game based on constructing vehicles for misbehaving swine. The plugins were published by playook.info, which is a company claiming to be a producer of "free flash games". Suspicions were heightened when Barracuda discovered that attempts to view the company's Whois records returned nothing, as playook.info hid its name behind Whoisguard. About a week ago, more than 82,000 Chrome users had the fake Bad Piggies and Angry Birds plugins installed; however, the original eight apps have since been removed from the store. Barracuda suggests that Chrome web store users consider any requested permissions with a critical eye in the future. "If the plugin requests any permission that does not seem reasonable, do not install it. If you have already installed, uninstall them immediately and change your passwords on other websites if possible."